Do you live in Northville, MI? Are you looking to rent a party bus? If so, then allow us to introduce ourselves. We are Rockstarz Limousine and Party Bus, and with a number of years experience behind us in this industry, we can guarantee that you will love your time with us no matter the reason for your celebration. Our party bus in Northville is specifically designed to allow you to invite as many guests as possible thanks to the layout of the bus. In addition, our high quality leather seating will allow your guests to just have a rest while the party goes on around them, and we can guarantee that you are going to be partying. The Northville party bus rental service that we provide is going to result in you having what amounts to your own private nightclub. First, you have our fully professional driver who can help you out as well as an ear blasting sound system that is going to get your party really pumping from the very beginning. Throw in the seriously cool laser light show, and you have a party bus that is full of life and unlike anything else that you have previously experienced. 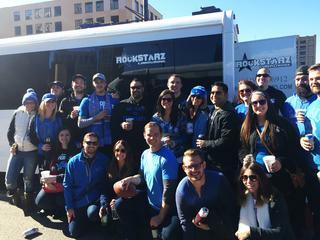 Previously, our Northville party bus service has been used by a huge number of people that have come to us in order to celebrate a wide range of occasions. Whether it be your birthday, a special occasion or even, an anniversary, the list just goes on and on, and we can accommodate you no matter what it may be. So, any resident of Northville who is looking for a party bus should give us a call now here at Rockstarz Limousine and Party Bus. The other option is to use our website, and a member of our team will then be in touch as quickly as possible to discuss your needs.